But before we do, let’s take a look at the design basics of creating an online feedback form. With these in mind, let’s start off with some background information on Customer Effort Score. CES is a very important metric to apply – especially considering high effort results in lower online customer loyalty. In short, if your customers are forced to expend more effort trying to achieve their online goal than they expected, they’re much more likely to leave your website. However, thanks to CES, which is considered a highly actionable metric, you can much more easily pinpoint weaknesses in your online funnels. In a feedback form, you can ask for the CES with the following question: “How much effort did it take you to achieve your goal?” whereby the visitor must select a rating on a five point scale from “very much effort” to “very little effort”. Here is an example of the scale below. You can collect CES after the customer has surpassed an important online touchpoint such as signing up for a trial or filling in a form. This works well because they have achieved some sort of goal. It’s also a great source for real-time feedback. Alternatively, you can gauge how much effort it takes your customers to get an issue resolved using online customer service touchpoints. This includes FAQ pages, after email support, upon reading a knowledge base article, etc. Now that we’ve looked into where to collect CES on your website / mobile app, it’s time to dive into the different types of feedback form templates you can use. 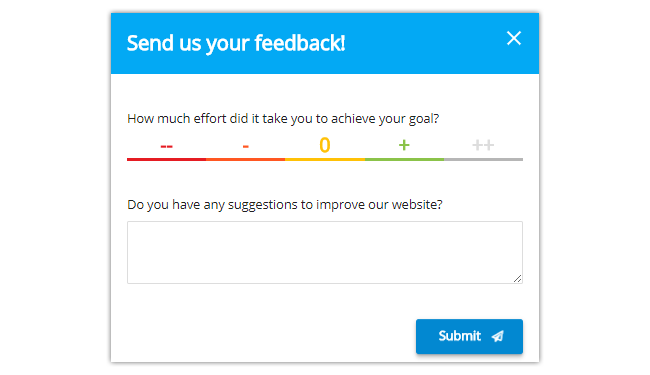 Depending on what you want to achieve and of course, how you’re going to achieve it, there are various online feedback form templates you can use to collect Customer Effort Score. Let’s take a look at these. This is the most common feedback form template using CES. Simplistic and to-the-point, this feedback form template is often deployed at the end of a funnel (or when they’ve reached a particular goal). This form is also great for obtaining deeper insights into why the visitor is or isn’t struggling with something, thanks to the open comments section. Alternatively, CES can be combined with Goal Completion Rate (GCR) in a feedback form. For example, if your visitor fills in that they’ve achieved their goal (meaning they’ve selected “Yes” in the feedback form), you can follow up by asking how much effort it took them to achieve their goal. Additionally, you can add a multiple choice pull-down or radio buttons to gauge what the goal was of the visitor, with ‘What was the reason for your visit?’. This will help you to accurately assess and filter feedback in the analysis stage as you can categorise the results. 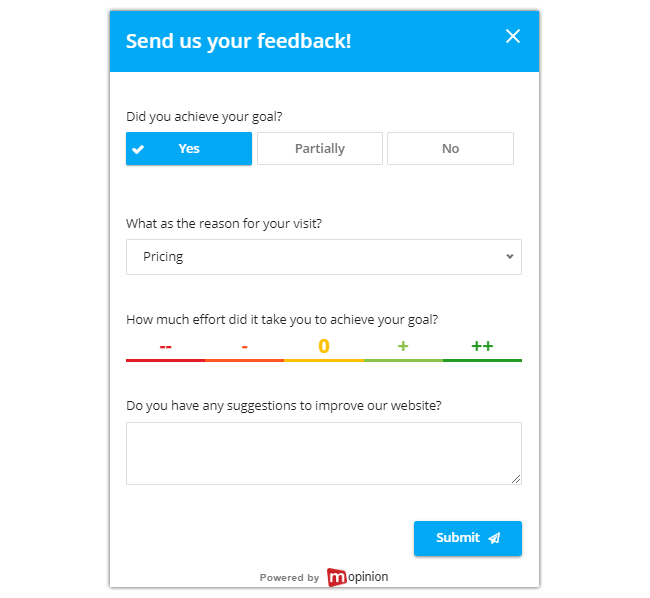 This particular feedback form template is most often used by businesses that use Net Promoter Score (NPS) throughout all of their feedback forms. Typically, this is because for these businesses NPS is a general metric and Key Performance Indicator (KPI) that is used as a standard. This is most often collected at the end of a funnel. You can either present the form via an embedded feedback form that is built into the page or set it up as a slide-in or modal form that appears after the visitor successfully reaches a predefined goal (you can set these up yourself). 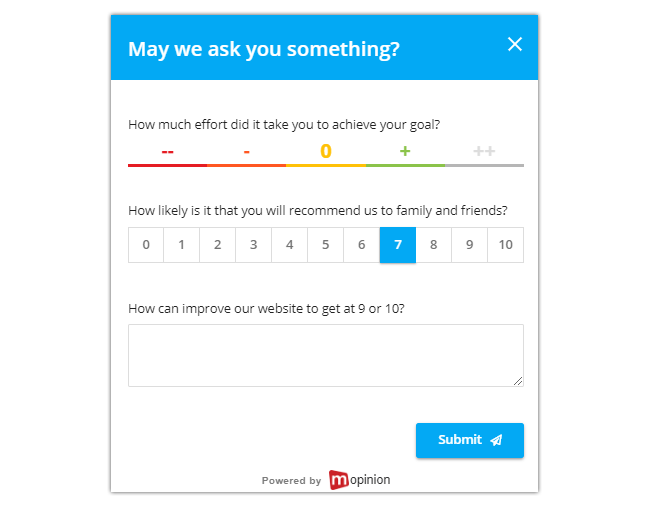 Typically with NPS, you’ll ask, “How likely is it that you will recommend us to family & friends?” in your feedback form. As a follow up, you can then ask (depending on the score they’ve provided), “How can we improve our website to get a 9 or 10?”. How much effort are YOUR visitors making? Learn more about using CES in online funnels here. Want to learn how to create other kinds of feedback form templates? Check out this overview.